The remnants of Gordon may enhance development of showers and thunderstorms through Thursday with scattered activity persisting Friday as well. Overall, it will not seem unlike an active summertime pattern, though some pockets of heavier rainfall are possible. Today and Tonight: Thursday will be the busiest of the next several days. Tropical moisture, a sea breeze and some warming will lead to scattered showers and thunderstorms breaking out through the day. About 70 percent of the area should receive rain, which could fall heavily for a short time. Be on the lookout for heavier thunderstorms, some areas could pick up a quick inch or two of rain. Please remember that if you come across a flooded road, find another route. It is much better to be a few minutes late than to stall your car! Highs will not go beyond the mid 80s. Overnight will be partly cloudy with lows in the low 70s. Up Next: Friday will bring another round of scattered showers and thunderstorms, with a little less of a tropical connection. Highs will be in the upper 80s with lows in the low 70s. Over the weekend, there should be a tick down in rain coverage with only isolated afternoon showers. Therefore, highs will go a little warmer into the low 90s. A front may approach the area next week but will stall and maintain high rain chances rather than change temps. Football Forecasts: Friday night high school games should find showers and thunderstorms diminishing in coverage around kickoff. One or two games could meet a delay if there are any remnant lightning strikes around. For LSU’s opening Saturday at home, tailgaters and game-goers should find a mostly dry and warm day. However, the warm season pattern is still alive and isolated showers and storms are expected to pop during the second half of the day. These types of cells are unpredictable until they develop so keep an eye to the WBRZ WX App. and we will all hope they miss campus. 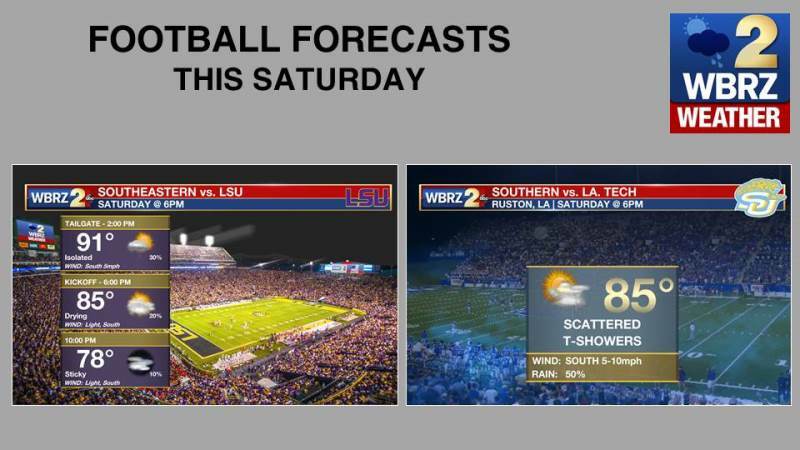 Southern will travel to Ruston where there is a better chance of showers and thunderstorms up to game time. The Tropics: The remnants of Gordon continue to produce rain across the Lower Mississippi River Valley. While rain coverage may be enhanced locally due to tropical moisture feeding northward, widespread flooding as occurred to our east is not expected. 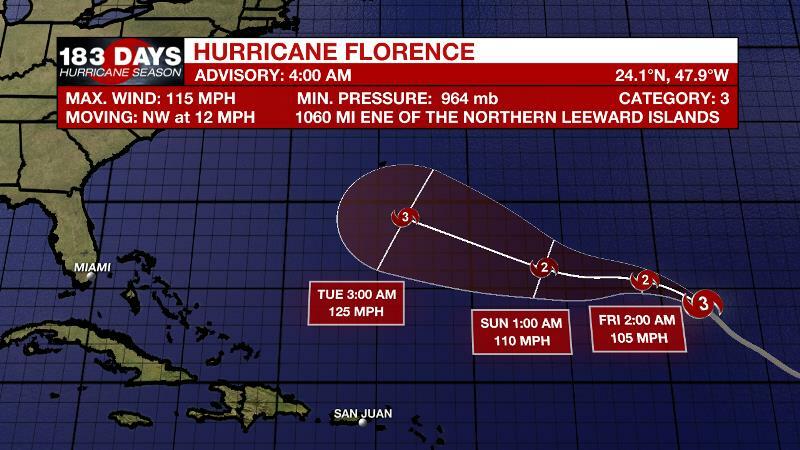 Elsewhere, Hurricane Florence became the Atlantic Basin’s first major hurricane of the season. The storm is quite powerful with 115mph maximum winds and is moving northwest into warmer water. Bermuda and the eastern United States will need to keep an eye on this storm. Finally, another wave just off the African Coast is likely to become Tropical Storm Helene within the next week as we near the typical peak of hurricane season. Tropical Depression Gordon will continue to weaken and move slowly northwest across Arkansas through Thursday. A feeder band of deep tropical moisture will extend from the Gulf, through southeast Louisiana and southwest Mississippi and to Gordon. Precipitable water will be in the 2 to 2.25 inch rang, which will allow much greater coverage showers and thunderstorms. Activity will begin over coastal areas early and spread inland through the day. There is potential for one to two and possibly three inches of rain in a couple hours out of any persistent thunderstorms. Of course, forecasting the exact placement of these higher rainfall amounts is not possible, but any persistent heavy rain that falls in low lying, poorly drained areas may result in urban and small stream flooding including some streets. Feeder bands associated with the remnants of Gordon will slowly become less organized and eventually detach from the storm through Friday. Once Gordon runs its course, the weather pattern will transition back to regular onshore flow with marine breezes triggering isolated to scattered showers and thunderstorms each day. An elongated frontal zone will settle into the Lower Mississippi Valley early next week but is not likely to reach the local area with any temperature changes. However, it could serve as a better focus for enhanced rainfall next week.